Ginger beer is a carbonated drink that is flavoured primarily with ginger and sweetened with sugar or artificial sweeteners. Most ginger beer produced commercially is a manufactured soft drink. The original version, rarely produced commercially since the mid-twentieth century but often home brewed, is a brewed alcoholic beverage. Brewed ginger beer originated in England in the mid-1700s and became popular in Britain, the United States, and Canada, reaching a peak of popularity in the early 1900s. Today ginger beer is almost always produced as a soft drink. 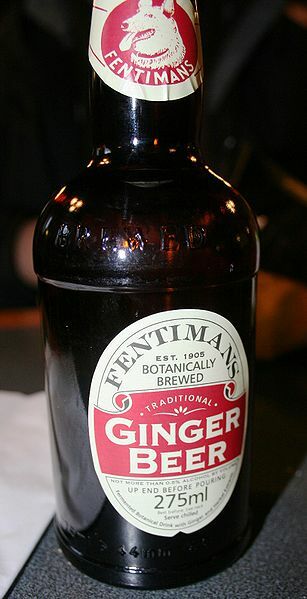 Ginger beer as a soft drink has been moderately popular in many parts of the world since it was introduced. The ginger beer soft drink may be mixed with beer (usually a British ale of some sort) to make one type of shandy, and with Gosling's Black Seal rum to make a drink, originally from Bermuda, called a Dark 'N' Stormy. It is the main ingredient in the Moscow Mule cocktail. 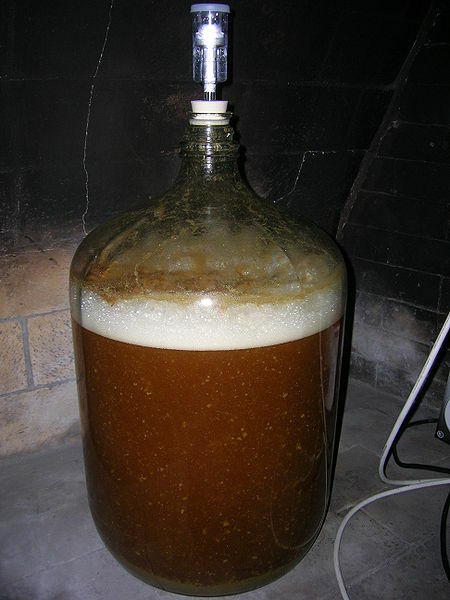 Left: A 6.5-gallon glass carboy acting as a fermentation vessel for beer. Homemade ginger beer can be made as either a soft drink or an alcoholic drink (see the recipe below). Make it in a carboy with more sugar or malt extract, and with longer fermentation time, for alcoholic ginger beer. Simmer the ginger, lemon zest and sugar in about 1.5L water for about 10 minutes. If using yeast as the fermentation starter, rehydrate the yeast in a glass of warm water for 5 minutes. Add the lemon juice, cream of tartar and water to the fermenter (see note). Let the mixture sit in a closed container until it has started bubbling well, which should take 8-12 hours with yeast, or longer with kefir grains. Bottle into PET bottles or other soft plastic food-safe bottles. When the bottles are hard (not just firm), put them into the fridge. Fermentation starter: use kefir grains or tibicos or ginger beer plant or ale yeast or bread yeast. Lemon juice is to provide acidity (as well as flavor). Fermenter: a food-grade bucket will do, or a large stainless-steel pot; don't use copper or aluminium. If left to ferment longer (about a week) a yeasty colony called a Ginger Beer Plant will develop. Carbonation will also increase, greatly raising the chances for bottle (or other container) exploding.